Aww. But I love that little G4 Cube. Even better? Put a Mac mini inside it: http://www.123macmini.com/macminicube/ — And a mini with a Quad-core processor in would truly live up to the name of the Power Mac Cube. And the 20th Anniversary Mac, despite being ugly and coming just too soon to get the benefits of USB and OS X compatibility, is also one of the best Macs ever. It was the whole essence of the Mac’s simplicity and quality in one, delivered-by-limousine package. Lastly, if the hockey-puck mouse had been an inch bigger in diameter, it would have been excellent. Posted by David Kendal on October 8th, 2009. Love the Mini Cube idea. And I’m not agreeing with these “worst of” lists. 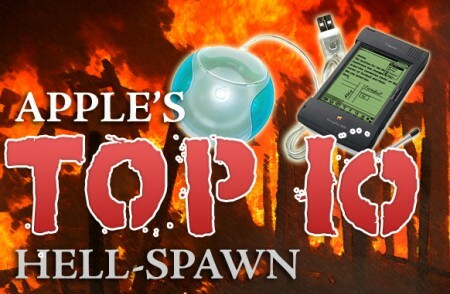 Cripes, this is a site about the friggin’ Newton, which makes every “worst of tech” list there is. Even the hockey puck mouse has a special place in my heart: it came with the first iMac G3 I ever got my hands on. Posted by davelawrence8 on October 8th, 2009. Its a shame that there are so many blogs nowadays because everything gets covered several times over. I’m actually the editor for AppleReviews and I was unaware of any of these other posts, we researched into the products e.t.c before posting. It was not copied and pasted. The main reason that the lists are usually the same or similar is because there are only relatively few Apple gadgets that flopped. Its just pure coincidence that most people pick the more interesting hardware items, or those they haven’t seen before. Posted by Ben Gribbin on October 9th, 2009. I’d believe it’s coincidence if it didn’t happen so often, and at intervals that are so close together, Ben. Just in the last week alone, there have been two or three similar posts. Probably five to six in the past month. That’s not coincidence. That’s laziness. You’re right about the amount of blogs hosting similar articles. That’s the nature of the game. But this one thing has gotten out of hand. Thanks for you input, and keep up the good work. Posted by davelawrence8 on October 9th, 2009. Gee Dave…I have most of the items on that list! I’m guessing that few, if any, of the list authors have ever used an Apple III, Lisa, or Mac Portable – Heck, how many have even actually *seen* one in person? Perhaps the “Worst of Mac Author” should be on the top ten list of poor bloggers. Posted by Curtis on October 12th, 2009. Indeed, Curtis. These folks just dig through other blog posts, find out what didn’t sell well or had some flaw, and speculate from there. It makes for crummy writing and me-too page hits. Posted by davelawrence8 on October 14th, 2009. I’m probably one of the few who had absolutely no problem with the USB round mouse (I shan’t call it “hockey puck”). It actually did good for my right hand. And – guess what? – today it’s still connected to the Apple USB keyboard that was included with my old iMac G3. Only I use it… attached to my G4 Cube, because sadly that iMac is no more. Posted by Riccardo Mori on November 1st, 2009. Thank you, Rick, and nice to hear another puck mouse user who’s unashamed. Posted by davelawrence8 on November 1st, 2009. Posted by Newton Poetry — Newton makes ‘top of the flops’ on June 20th, 2011.